After debuting it last year, Maryland Deathfest is once again presenting another Baltimore metal festival, Days of Darkness, the weekend before Halloween. It goes down October 27 & 28 at Rams Head Live and Baltimore Soundstage, and…. 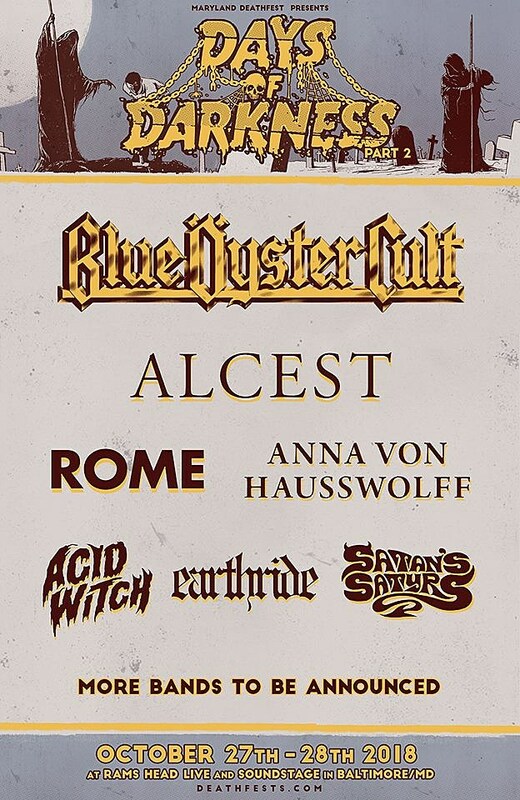 the initial lineup includes classic hard rockers Blue Oyster Cult and French black metal shoegazers Alcest, along with Rome, Anna von Hausswolff, Acid Witch, Satan’s Satyrs, and Earthride. Tickets are on sale now and many more bands will be announced soon. Meanwhile, Maryland Deathfest returns in May. Related: The Quiet Legacy of Blue Oyster Cult.